When I was six, I journeyed 2,000 miles from Mexico to Greensboro, NC, where my dad was already living. Consumed in a new world with a different language, my parents sacrificed their ties to what they deemed familiar, to give my two younger siblings and me a brighter future. I grew up in Greensboro, and it’s the only home I really remember. When I started elementary school, I had difficulty learning the language. I was not able to go to the bathroom because I did not know how to ask. Yet, as I began to get the hang of English and comprehend what was going on around me, I began to gain confidence. I even joined a Little League baseball team. Despite working constantly to provide for and my siblings, my parents did not miss a single game. My coaches and teachers played a big role in keeping me on the right path.My baseball and soccer coaches instilled in me great work ethic and perseverance, and my teachers inspired me to continue learning and motivated me to continue my education. Although my coaches and teachers were there for me, my biggest support system has always been my parents. They have supported me every step of the way and sacrificed everything for my siblings and me. While I always knew that we were undocumented, I started to see the struggles endured by the undocumented community, as I got older. I served as the unofficial translator in my family for any important tasks my parents had to complete. In high school, I learned that I was ineligible for a driver’s license, because I didn’t have a social security number. All of my classmates and friends began driving, but I could not. As small as it may seem, it was demoralizing. Eventually, I started applying to colleges and faced conversation after conversation during which people told me I couldn’t attend a university, despite my strong academic record, because of my status. I realized just how many doors my status would close for me, and it was a devastating feeling. Thanks to the array of wonderful scholarships, including TheDream.US scholarship, I was fortunate enough to finish my Associate’s Degree in web development. Without these scholarships, I would have likely had to sacrifice my goal of higher education. Now, I have many friends who are in similar situations and are unable to stay in school. These friends, fellow Dreamers, want to contribute back to our shared country, as well as higher education for Dreamers creates a level playing field. Our community can only grow from those who pave the way. If more and more people from our community become lawyers, engineers, doctors, it creates change. Throughout my life, fellow Dreamers and DACA-students have encouraged me to never stop aiming higher. 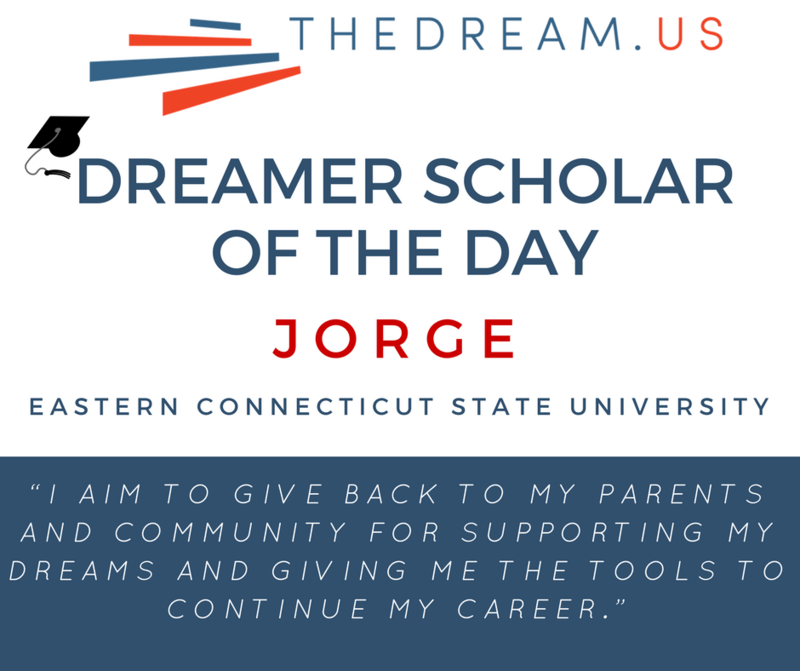 After graduating from Eastern Connecticut State University, I plan to volunteer as much as possible for organizations that make a difference in the lives of undocumented students. I also hope to create my own organization that helps LatinX students get into the tech industry. As a computer science major, I see how the tech industry lacks diversity and would love to bring more Latinx students into the field. My career aspiration is to become a computer science engineer to solve the issues our communities face every day. After getting my foot in the door of the tech industry and building my network, I want to start a non-profit organization to help minority students get into technology. I want to ensure that Dreamers have access to better resources that will allow them to find mentors and scholarships to continue their education. My own experiences have inspired me to help others in similar situations. Remaining in the United States is crucial to these goals. The fact that I am able to go to college and continue my education is proof enough. There are so many people that want to see me and others succeed. I aim to give back to my parents and community for supporting my dreams and giving me the tools to continue my career. I hope that other current and future Dream.US scholars know that there are people who want us to succeed –we just have to keep working hard and not be afraid to seek help.